Two more large dinosaurs will be added to the World of History model range in July 2015. New versions of the fierce meat-eaters Giganotosaurus and Spinosaurus are being added to this Schleich model series. 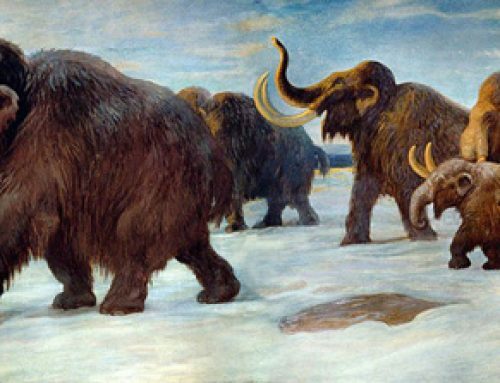 The World of History model range next year is going to feature a lot of carnivores. Measuring around twenty centimetres in length, this is a beautifully painted Giganotosaurus and it has been given a very interesting pose, with its left leg raised as if this dinosaur is just about to take a step. As it moves forward, it is balancing on its tail. In addition to the fearsome Giganotosaurus, Schleich will be introducing another version of Spinosaurus to their model series. Just like the orange Giganotosaurus, the Spinosaurus has been vividly painted and it too, will feature an articulated lower jaw. The Spinosaurus is painted very brightly, in a beautiful violet colour. Both these models will be available from Everything Dinosaur in July 2015. Beautiful Spinosaurus dinosaur model from Schleich. Intriguingly, the Spinosaurus dinosaur model is posed in a quadrupedal stance. This position, that of a carnivorous dinosaur walking on all fours, has recently found favour again after a scientific paper was published that, having reviewed the known Spinosaurus genus fossil material, suggested that this large dinosaur was semi-aquatic and was not capable of walking in a bipedal position. With these two new additions (due out in July 2015), the Schleich World of History model range will grow to a total of twenty models. 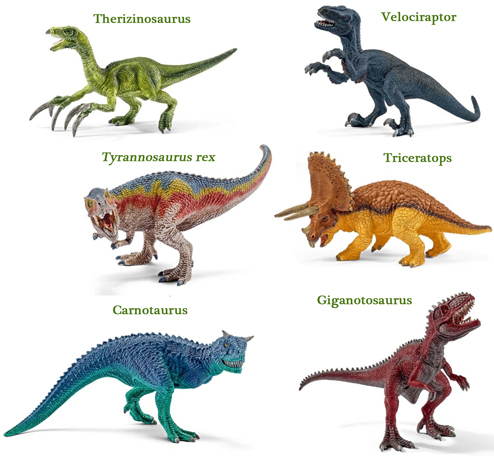 Eleven of these models will represent Theropod dinosaurs. The popular small dinosaurs range is being retired and replaced with a brand new range of six dinosaurs. These models will also be available around July of next year. This new range is also Theropod heavy, with only Triceratops (an Ornithischian dinosaur) a non-Theropod. Once again these models are very colourful and they range in size from a fraction under seven centimetres in length to around twelve centimetres long. A new range of colourful dinosaur models. The first models in this new range will be Carnotaurus, Giganotosaurus, Therizinosaurus, Triceratops, Tyrannosaurus rex and Velociraptor. These dinosaurs have been wonderfully well painted and we love the vivid, vibrant colours. The blue Carnotaurus has attracted some controversy. It has been claimed on some websites and forums that Schleich have omitted the arms. In the pictures of this model no forelimbs can be seen. At Everything Dinosaur, we have high resolution images sent into us by Schleich and these too, in the case of the Carnotaurus replica, don’t seem to show any arms on this particular dinosaur model. To help resolve the situation, we chased up Schleich for an official comment. We have been told that this model does indeed have arms, but they are very small. Carnotaurus did have minute arms, why these Theropods had very much reduced forelimbs remains a mystery. Schleich have made a number of Carnotaurus models in the past. A Carnotaurus model featured in the now retired “Saurus” range of prehistoric animal models and a Carnotaurus was included in the company’s World of History model range back in 2013. Both these replicas had the small arms, so typical of an abelisaurid. Schleich Carnotaurus models from different ranges. We have yet to see a sample of the new, blue Carnotaurus that is included in the small dinosaurs model series. Once we actually get to handle the model and photograph it ourselves, the “missing arms” mystery will be resolved. Looks like Schleich and Everything Dinosaur have some interesting times ahead. You might be right, however, we have checked our information and production notes and there is no reference to articulation in the small dinosaurs model range. We should see finished samples in the New Year, then we will know for sure. Ok i recently sent a rant on Schleichs Facebook page about how disappointed i was in there decision to make a second Giganotosaurus and Spinosaurus. To make things short, i find it ridiculous, yet they seem to think that it would keep there buisnus alive, i told them if they want to make similar models to ones they already made, they could call the dinosaur a relative, for instance, this new Giganotosaurus can be called a Mapusaurus which is a Relative of Giganotosaurus. Parents wont know the difference, an i don’t think they would care about that, but i do think that there kids would care if they keep releasing the same blasted species for the Same line very frequently.